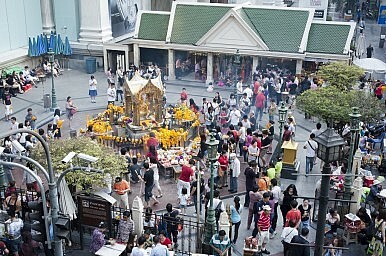 People visiting the Erawan Shrine in Bangkok in the day. The Diplomat talks with Dr. Zachary Abuza about the August 17 deadly bomb blast in Bangkok and its implications. A number of Thai officials have said that all the evidence from the bomb blast definitely points to an attempted mass casualty attack. Would you agree with that assessment, and if so, what is the evidence for this? I would concur with that assessment. The Erawan Shrine is a hugely popular tourist venue. It’s visible from the BTS [Bangkok Mass Transit System], just beneath a station, and between three malls, so many people pass by it. With women who perform traditional dances, it is a very photogenic shrine, popular with Western and Asian tourists, as well as Thais themselves. Though a Hindu not Buddhist shrine, Hinduism is deeply ingrained in Thai society and Thais really saw it as a place to pray for good luck. The intersection is one of the busiest in Bangkok. The bomb was detonated at rush hour. There can be no doubt that the device, made of high explosives, was meant to cause mass casualties. Though no group has officially claimed responsibility for the attack, some have already begun to speculate about this question. The more obvious suspects are anti-government factions or Malay-Muslim insurgents in Southern Thailand, but other theories are out there as well. Keeping in mind we still know very little, what signs should we look for in the coming days that might give us a better idea about who might be responsible for this? Right now there are three groups of suspects: Radical Red Shirts, Malay insurgents in the Deep South, or other Islamist terrorist groups. All have motives and capabilities. People often point to Hezbollah, which came very close to bombing the Israeli embassy in Bangkok in 1991. More recently, in 2012, a bomb prematurely exploded in a Hezbollah bomb factory in Bangkok. So outside groups have operated in Thailand in the past and have come close to perpetrating attacks. But Hezbollah seems to be a very unlikely candidate, as they tend to be activated when Iran needs a diversionary or escalatory threat. Jemaah Islamiyah (JI) tried but failed to target Bangkok back in 2003. But there is very little left of JI that would have the means, will or capability to carry out such an attack. Though Islamic State (IS) has won some followers from across Southeast Asia and several successor groups have pledged ba’ayat (allegiance) to the group, so far there have been no credible reports of IS operating in Thailand. Some Chinese media outlets reported that it was carried out by a Uighur terrorist angry at Thailand’s recent deportation of 109 back to China, but this should not be dignified with a response. The government is likely to do all that it can to attribute this to radical Red Shirts, which is exactly what they did after the bombing on the Thai holiday island of Koh Samui in April despite all the evidence to the contrary. Indeed there have been several arrests in the Deep South since then that authorities have quietly acknowledged are linked to the Koh Samui attacks. It would seem odd for Red Shirts – who admittedly do have reasons to discredit the junta – to attack a religious symbol. They might be anti-junta, but they are still Buddhists. Small attacks against symbols of the regime are one thing, major mass-casualty attacks against tourist venues seems very unlike the Red Shirts. But the regime will obviously look for links to justify its hold on power. Finally there are Malay insurgents. They have never really targeted Bangkok before. Indeed, they rarely go out of area. There are exceptions to this. They hit Hat Yai, which does get Bangkok’s attention. They’ve hit Sadao, Betyong and Sungai Golok which, though not western tourist destinations, are Malaysian tourist destinations, thus they feel they can go out of area while staying in area. In December 2013, they did place a bomb – but did not detonate it – in Phuket. Most insurgents realize that going out of area and targeting Thailand’s tourism industry is potentially counterproductive, as the government would come down so hard on them. But there are younger militants who are concerned that after 12 years, the current rate of violence is not working and that the tempo needs to be escalated. Indeed, much of the evidence for the Koh Samui bombing is linked back to the rogue Barisan Revolusi Nasional-Coordinate (BRN-C) that bombed the Lee Gardens hotel in Hat Yai in March 2013 without approval. Frustration is palpable. I really hope that the authorities don’t rush to judgement on this as they did to the Koh Samui attack, because the politicization completely delegitimized the government and their security services. Thai officials have said that the attackers were targeting tourists and Thailand’s economy. What impact do you think the attack will have on tourism and the country’s economic prospects? Tourism is a major driver of the Thai economy. The Koh Samui attack didn’t have as adverse an impact as I had anticipated. This attack in downtown Bangkok could really hurt tourism as people are making reservations or plans for high season. The Thai economy has been flailing since the coup, with quarterly estimates downgraded at every turn. Thailand just released some very disturbing export numbers, while foreign direct investment is streaming to Vietnam and other locales. The baht has been hammered recently. This attack is just terrible news for the Thai economy. How do you expect the Thai government to react to the incident? Do you think that its response will have a bearing on the political situation in the country more generally, including a much-delayed return to democracy through elections? The government will take this seriously. This is the largest terrorist attack in there capital, a mere block from the police headquarters. The junta, if nothing else, has to guarantee peace and security. I really hope that they are more professional than they were in the Koh Samui attack, when, without any evidence – forensic or otherwise – the junta linked the attack to the Red Shirts. The junta is in serious trouble. They are prolonging their time in power using the referendum on their unworkable constitution to prolong democratic elections. For more than 50 percent of the electorate, the junta has absolutely no legitimacy. Even many of its original supporters are turning on the junta due to their ham-fisted policies, their inability to kick start the economy, and a very troubling constitution. All that’s left are a group of unabashed and unashamed royalists. So it’s really important for the junta to do this investigation professionally and transparently. But those are not characteristics that the current government under Prayuth Chan-o-cha has demonstrated to date. Regardless of whether the attack was perpetrated by Red Shirts or southern Malay insurgents, it speaks to the need for the junta to engage in genuine reconciliation. Since May 2014 the military government has spoken about reconciliation with political opponents at the same time as it has systematically disenfranchised them. There has not been a single decision or court ruling that has been in favor of the Pheu Thai or Red Shirts. Likewise in the south, the government talks about its desire for peace talks with the insurgents, but it has no political will to make the necessary political concessions to end the insurgency. The military government simply expects the insurgents to surrender without any agreement on political devolution, amnesty, or the protection of linguistic and cultural rights. An explosion has killed at least 16 people. Islamic State in Thailand: A Phantom Threat?Australia, Thailand Mull New Terror Pact Amid Islamic State FearsWho Will Claim Responsibility for the Recent Bangkok Bombing?Thailand’s Junta Reshuffles its Cabinet Amid UncertaintyWhat Do We Know About Bangkok’s Deadly Blast?